The best storage professionals of rocket city have everything you need. Being an expert in Space City doesn’t always mean what you might think. For us, it means bringing professional know-how to self-storage space. Our location along Houston’s Energy Corridor brings easy access to storage solutions for your home or business. We have great storage unit prices for your personal storage and business storage. We have drive-up access for your business and recreational vehicles. So unless you’re planning a trip to the moon, our space talk is your spacewalk…or drive. We’re located just a few miles south of I-10! That drive is an easy one to our Whittington Drive storage facility! Our location is a few miles south of I-10 and the same short distance north of Westpark Tollway. X also marks the All Weather Storage facility for the midway point between Sam Houston Tollway and Addicks-Howell Rd. No matter where you are coming from or heading to in West Houston, we’ll be right on your way. You can pick up storage supplies on the way into the office and drop off archived records on the way home. You can even stop at the Ashford West Post Office across the street from us after you’ve wrapped and packed your shipment in our packing supply shop. We have the best storage options, storage unit sizes, and most importantly low prices. We provide uncovered parking for vehicles that just need a place to park. You can access your safely stowed vehicles daily; we offer the same, easy access to your stored belongings. You’ll find professional supplies and assistance in our office from Monday to Saturday, with a Resident Manager on property for any unexpected, outer-space experiences! Truck Rentals – Reserve your truck here! Whether you’re tackling your first move or the tenth, U-Haul has the Right Equipment at the Lowest storage unit prices for whatever your moving needs are. 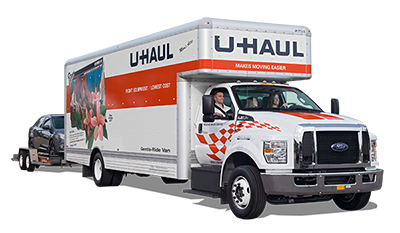 U-Haul has the largest selection of new trucks specifically designed for your upcoming personal storage move. Check out our storage solutions today.